WORKFORCE MANAGEMENT | Tracking Systems, Inc.
Quickly create and assign jobs on the go or in the office with fast and easy entry forms. Jobs can be assigned to one or multiple team members and notifications are automatically sent to them, alerting of their newly assigned job. Attach job notes, comments, files, and photos to provide all necessary information for the field techs to perform the job. With multiple schedule views ranging from daily agendas, team gantt charts, and map plots, gain further insight for advanced timing and location based scheduling. Gantt based scheduling tools allow you to easily find available team members and timeslots for new jobs. Plotted job maps allow you to easily assign jobs based on relative location for your team members. Use predefined service templates to quickly fill out job details based on common services you provide. Track the time and location of job status changes made by team members to confirm that team members truly arrived at the job site on time and completed the job as indicated. When field agents change the status of a job to indicate the the job is in progress, pending action, or completed, the update entry in the activity feed is appended with a timestamp and a geotag of the user’s location. Opening the geotag will plot the location of the user on a map at the time they made the update along with the pinned location of the scheduled job site, allowing you to confirm that team members reached the job site and left the job site when indicated on the job record. 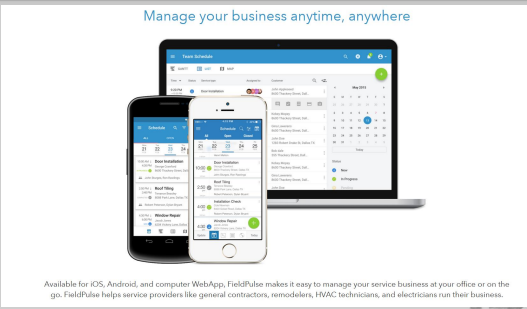 Whether out in the field or in the office, quickly create itemized estimates and invoices for customers. Add line items to the invoice in different quantities with different tax applications. Subtotals, tax, and totals are automatically calculated for you. Once generated via computer or smartphone, simply send or print an auto-generated PDF of the invoice for your customer. Easily update the invoice status to never lose track of a payment. An Invoice Item Repository allows you to quickly and easily insert common invoice line items into your invoices without repetitive manual entry. Store invoice item templates of labor rates, common supplies used, equipment installed, and more. Create estimates, quotes, or proposals for customers on the spot with your smartphone. Once approved by the customer, immediately accept customer signatures on your PDF as an agreement to move forward on your proposal. To convert the accepted proposal to a customer invoice, simply change the status and regenerate the PDF as an invoice. No more recreating estimates to invoices. Never lose track of payment history with documented payment records. Mark partial or full payments to accurately reflect the status of the invoice to always stay on top of the balance due for your customer.